K13 is an endangered Hawaiian Monk Seal. The scientific name for this species is Monachus schauinslandi but I prefer the Hawaiian name ilio-holo-i-kauaua which means ‘dog that runs on water’ or ‘dog running in rough seas’. Monk seals are named for the loose folds of skin around their necks that look like a monk’s cowl. 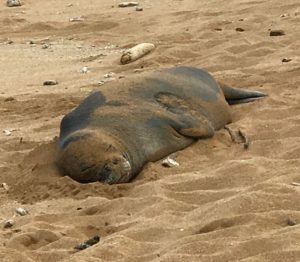 I was lucky to see K13 napping on a beach on the island of Kauai. This old girl has had a tough life. Look closely and you will see a large scar behind her left flipper. She also lost her left nostril and is blind in her left eye from shark bites. Despite her physical limitations, K13 has managed to survive and thrive. On April 20, 2018, she gave birth to a female pup on a remote Kauai beach. Monk seal pups weigh around 35 pounds at birth and are about three feet long. K13 stayed on the beach and nursed the little one for 37 days straight without eating. This is normal behavior for Monk Seals. The mother survives on the fat stored in her body. The average pup will put on about 100 pounds when nursing. When all of the fat is depleted, lactation stops and the mother goes back to foraging for food. The newly weaned pup must learn to forage for food and avoid predators. It is a dangerous time for these babies. Beside sharks, other threats include aggression from male seals, infectious disease, parasites, toxins and danger from human interactions. Dogs have attacked and injured the helpless pups. The good news is that K13’s daughter is doing well! After weaning her pup, K13 has been busy foraging for food to replace all the weight lost during lactation. She hunts at night for fish, octopus, squid and crabs then comes ashore during the day to rest. While resting, volunteers with NOAA Pacific Island Fisheries Science Center (PIFSC) watch over the seals. That’s how I met Lloyd, a volunteer who told me all about K13. After erecting signs to keep people from bothering K13, Lloyd took detailed pictures to help further our understanding of this endangered species then spent the rest of his time educating curious visitors. Most of the seals are found in the Northwestern Hawaiian Islands. 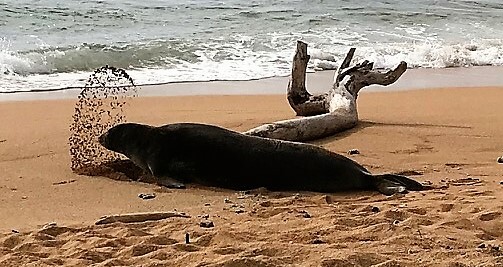 Unfortunately, their population has decreased while the number of seals on the main islands of Maui, Kauai, Oahu and the Big Island has increased. The 2016 survey estimates the population of monk seals to be between 1,348 to 1,542. From 2013 to 2016, their population actually increased by 3% per year for the first time after decades of decline. 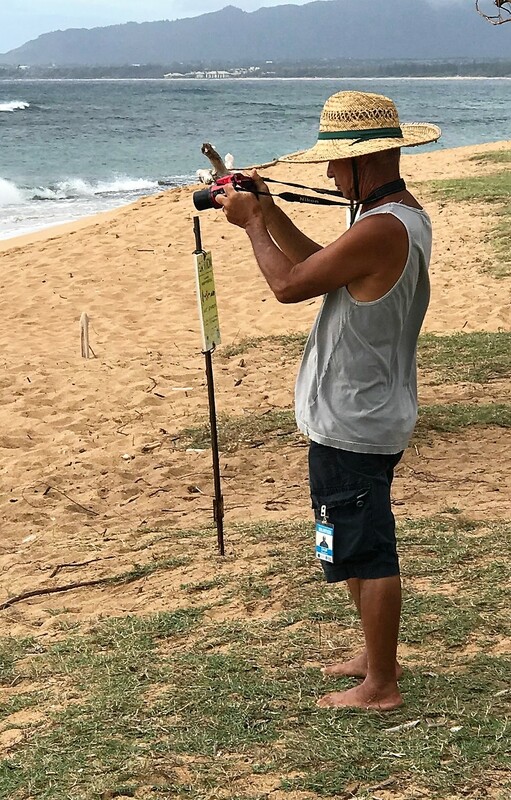 I would like to thank Lloyd and the other volunteers at NOAA PIFSC, the Marine Mammal Center on the Big Island and NOAA PIFSC for their work to save the endangered Hawaiian Monk Seals and other creatures. For more information or to make a donation, please go to www.marinemammalcenter.org or www.pifsc.noaa.gov/hawaiian_monk_seal.